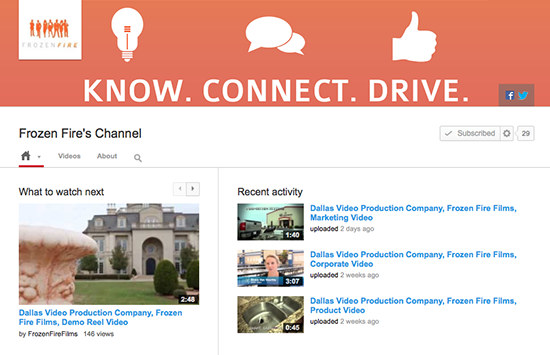 What is a YouTube Channel Feature Trailer Video? The featured video is the the first video that you can see on a YouTube channel. At Frozen Fire, our YouTube featured trailer video is our demo reel. The featured video should be something that will catch your audience’s attention and showcase your best work. This video will be your first impression to your potential clients — so make it count! Read why video marketing should be an important part of your digital business development strategy. Looking good can make the difference in someone clicking on your video or beginning his or her search again. A video is like an interview, appearance is important and the first impression matters … the same rules apply for your YouTube channel. Having a visually interesting channel keeps your audience’s attention, and more important, it keeps their eye on your brand. You want to turn first time visitors into long-term subscribers. Using this tool to help you brand. Video marketing is an absolute must for today’s sales and marketing strategies and can be a powerful tool if used correctly. People are four times more likely to engage with a photo than with a text-based post, and 12 times more likely to engage with a video. With video players being readily available on Smartphones and tablets, video marketing is critical for business success. YouTube is the second most popular search engine, which is no surprise since it is owned by the most popular search engine — Google. Millions of people view YouTube each day. Isn’t it time you give them something different to look at? At Frozen Fire, our clients’ businesses are our top priority. Frozen Fire creates compelling videos that will excite, refuel, and recharge your image. View our video portfolio here.